Researchers have found evidence that humans have lived in the Granite Mountains for at least the last 8,000 years (to learn more about the archeological history of the Granite Mountains, see Christensen et al. 2001). During this period, many significant environmental changes occurred in the east Mojave Desert, and the Center offers unique opportunities to learn how desert peoples adapted to those changes. Dense concentrations of prehistoric sites recorded in the Granite Mountains indicate that the area was attractive to people for many reasons. Reliable water is the most important aspect of desert life, and a granite substrate holds seasonal water more effectively than rock in the surrounding volcanic or sedimentary ranges. The great diversity of plant species found in the Granite Mountains includes many that were important to earlier peoples. Pinyon pine, agave, mesquite, chia and many grasses were considered staples and were harvested as they came available each year. Small mammals, reptiles, insects, and bighorn sheep all provided important dietary protein. The Granite Mountains contain one of the largest collections of prehistoric rock art in the Mojave Desert, and one of the densest concentrations of painted rock art (mostly in red ochre) in California. 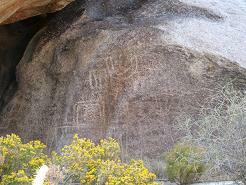 There are over a thousand painted images (pictographs), and over a thousand pecked images (petroglyphs), indicating that the area was important for spiritual as well as economic reasons. At the time of European contact, the Granite Mountains region was inhabited by the Chemehuevi, a Southern Paiute band who lived here for several hundred years. Research has shown that ancestors of the Paiute (Numic-speaking people to the north), and ancestors of the Mojave (Yuman-speaking people to the south) have lived in this region at various times. To early Europeans, mining and ranching were the primary economic uses in the arid southwest. Both required considerable time and effort for often very meager rewards, and thus were limited in the Granite Mountains for those very reasons. Many of the small deposits of valuable minerals that do occur in the Granite Mountains are in remote and inaccessible areas. The difficulty of extracting and hauling out ore in the steep, rocky terrain, and the cost of transportation to distant processing mills were no doubt factors in the abandonment of the many small claims that dot the range. That same rugged terrain and the lack of dependable water and forage have also restricted cattle ranching in the Granite Mountains (but it didn’t stop them from trying and doing it until 2002). 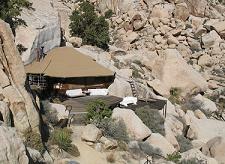 Access to water both allows and limits life in the desert. Historic inscriptions near springs and waterholes (1878, 1887-Granite Cove; 1882-Cirque Canyon; 1894-Budwieser Spring; 1906-Cottonwood Spring) show that the Granite Mountains were known and used by early European travelers. Water rights to these springs were bought and sold long before land in the Mojave was considered valuable. The U.S. military has left a definitive mark on the east Mojave Desert. In April 1860, following depredations attributed to the Southern Paiute (Chemehuevi), Major James H. Carlton and the First Dragoons were dispatched to punish the tribe and restore order. Areas of principal focus by this campaign included Marl Spring, the Kelso Dunes area, and the Old Dad, Providence, and Granite Mountains. During this campaign, Lt. Milton T. Carr and twenty-two men rode clockwise around the Granite Mountains. They stopped at Cottonwood Basin and Snake Springs, and camped at Granite Cove Spring, calling it “Diamond Spring” (later called “Arrastre Spring” for a Spanish arrastre found there). The next day they rode around the south end of the range, through Willow Basin, and up the west side to the Kelso Dunes. Although he describes terrain, and availability of water and grass, Lt. Carr only mentions encountering aboriginal trails and “rancherias” at Carr Canyon and on the Dunes themselves. After a series of violent encounters to the north and west of the Granite Mountains, the Chemehuevi surrendered at Camp Cady on July 2, 1860. In 1881 a rich gold vein was located four miles southwest of the Granite Mountains by a Chemehuevi named Hikoram. He showed the property to businessmen from Needles, who later filed claims when his had expired. The mines changed hands at least twice before being purchased by James A Hodgeman, who formed the Orange Blossom Extension Mining Company. By 1908 results were encouraging enough to have the company develop a large mine and mill, and a sizeable mining camp, all possible with water piped from Budweiser Spring, four miles to the north. The ore bodies did not last, however, and the camp was long abandoned when visited in 1917. The last Native American known to have lived in the area was a Chemehuevi nicknamed “Dusty” who lived and irrigated a small field at Arrowweed Spring. This is probably the same individual mentioned by Laird (1976:11) who was a Mountain Sheep Shaman with a Mojave name, which was ?Ilyaalyi?vya or Yaarirvya, and claimed stewardship over all the game in both the Providence and Granite Mountains. A cry (mourning ceremony) was held in 1907 at Arrowweed Spring after his death (Kerbavez and Harvey 1979:198). Soon thereafter, an individual known only as “the Englishman” obtained water rights to Arrowweed and several other springs in the area, which he sold in 1920 to Eddie Cornell of Porterville, Ca. In 1928, unable to raise enough cattle to make a living, Mr. Cornell sold the Arrowweed Ranch and water rights to the other springs to the Staples family, who had moved up from Amboy to Granite Cove the year before. Milton Staples, the family patriarch, was superintendent of the Amboy Salt Works. His son Kenneth was a mechanic there. Kenneth’s wife Frances had been raised in Bagdad during its heyday. They lived on the dry lakebed at Saltus, and Kenneth and Frances had a son, Milton, in 1923, and a daughter Marian, in 1926. 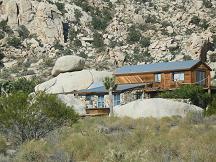 In 1927 the family homesteaded 320 acres in and around Granite Cove. Working with Ralph and Rena Stevens, friends from Saltus, they built a cookhouse, a house for Kenneth and Frances (“Staples”), a house for the Stevens’ (“Pink House”), and a house for Milton (“Green Shed”). Soon after came a garage, an icehouse for making (using the ammonia-transfer process) and storing ice, and a barn. They built a corral in the upper cove using riveted water pipe from the abandoned Budweiser Springs-to-Orange Blossom Mine pipeline. They began enlarging and improving the springs in the area, and ran a herd of over 200 cattle. During this time Ralph Stevens, originally from North Dakota (and who had also worked at the Saltus Salt Works), listed his occupation as miner. He was one of many to be prospecting in and around the Granite Mountains. During this time, at Snake Springs, the Billings family from Pasadena built a house and began mining in Cottonwood Basin. 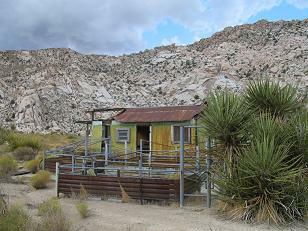 Some limited mining had occurred there since at least 1906, as evidenced by the inscription “Kaboose Lopez 4-1-1906” at a well-used mining camp. The Billings employed Herman Sulligar (“Sully”), who lived at Snake Springs and worked as a caretaker and miner for them. Herman maintained a weather station there, and the data was later used by John F. Gaines and Richard F. Logan in their report, “The Physical Geography of the Providence Mountains Area, Eastern Mojave Desert, California” (1956). Jerald and Lucielle Tuck bought the land from the Billings’ in the late 1930’s or early 1940’s. Herman Sulligar continued to work for the Tuck family through the winter of 1949 when he and his dog were snowed in for several weeks before being rescued. In 1929, Clifton and Katherine Barnes of Camp Cady bought the Arrowweed Ranch from the Staples family, and leased water rights to Snake, Cottonwood, and Coyote Springs. The Barnes family began running cattle and improving the ranch. They enlarged the existing structure and added two large bunkhouses, corrals, other small buildings, and water troughs and pipelines were added to all the springs. Mr. Barnes also located the Silver Queen claims with Oscar Hoerner and Emory S. Baxter in the May of 1932. The Barnes had two children; Beverly Kay, born in 1926 and Wayne Arthur, born in 1928. In 1931 the Staples family hired Alex Bernal, a cowboy living near Kingman, Arizona. The Bernal family moved out during a big snowstorm that Alex Jr., six years old at the time, remembers leaving several feet of snow blanketing the Granites Mountains. The Bernal family moved into a house that had been built near the Staples house in the upper cove; both were built against large granite boulders. The Bernals had six children; Alex Jr., Raymond, Eddie, Larry, Nora and Bertha. Another house built against a boulder at the mouth of the cove was part-time home to the Sandoval family. Mr. Sandoval usually worked in Amboy and frequently worked as a handyman in Granite Cove. The family lived here throughout the 1930s and 1940s until Mrs. Sandoval died in Barstow in 1947 or 1948. During the early 1930s, the present “Spring Cave” was drilled. The large concrete tank above “Staples” was built, and a dam of earth, concrete, and steel pipe and scraps was constructed in the wash near the barn, only to wash out in one of the floods that often accompany the infrequent heavy rainstorms. In 1935 Kenneth Staples sold water rights to a number of the springs on the north side of the range to Clifton Barnes, and in 1941 he bought them back. In 1938 Milton Staples died and left his interests in the ranch to Kenneth and Frances. The effects of World War Two were felt by everyone, even those living in Granite Cove. Young Milton joined the army in 1941 and Alex Jr. joined the navy in 1943. Everyone else was evacuated between 1942 and 1944 because the area was in the middle of General Patton’s California-Arizona Maneuver Area. The Staples family lived in Amboy until they were allowed to return to their home, only to find their remaining cattle eaten and their ranch damaged and looted by undisciplined troops. Kenneth and Frances moved to Twenty-nine Palms in 1950, moving from there to Las Vegas, then to Daggett, and finally to Sun City. Their son Milton, returning from active duty in the Pacific, managed the ranch. Milton eventually bought out all of the Stevens’ interest in Granite Cove. Alex Bernal Jr. made a career out of the military, working at Norton Air Force Base until 1963. Mrs. Bernal died in 1952, and Alex Sr. lived in Granite Cove until the early 1960s. In 1962, William Moore of Sheridan, Wyoming, bought the land and water rights from the Staples family. He sold everything in 1967 to Art Parker, a local rancher and miner. During the 1960s and 1970s, many additions were made to the ranch in an effort to increase the cattle operation. A corral and a tack house were constructed in the lower cove, and two windmills and a water tank in the main wash. Despite all this, raising cattle has never been very profitable in the Granite Mountains, and Art Parker sold his holdings in Granite Cove and around Snake Springs to the University of California in 1981 and 1983. The University of California became interested in acquiring land in the Granite Mountains through the efforts of Kenneth and Robert Norris. The Norris brothers had leased land at Dripping Springs (near Cove Springs) from the Union Pacific Railroad in 1961, and had built a cabin in the rocks there. Ken Norris was a professor at UCLA, and Bob taught Geology at UC Santa Barbara, and both used the cabin to house students on field trips to the Mojave Desert. In 1978, the University purchased Section 1 (in Cottonwood Basin), Section 5 (Snake Springs), and Section 17 (Dripping Springs/White Fang area). This was the beginning of the Granite Mountains Reserve of the University of California’s Natural Reserve System, known today as the Sweeney Granite Mountains Desert Research Center. Since then, the Center has hosted more than 30,000 students, teachers, and researchers who have come here to study the Mojave Desert, its organisms and processes.